Changing times: Ayesha Mansukhani, a Wharton graduate who opted to work for a PE firm in Mumbai, says companies here now ask for India experience—earlier, a good foreign degree would have been enough. New Delhi: As bankers in New York and London face layoffs and finance hiring screeches to a near halt, Indian expats are giving home a second look. To be sure, the so-called reverse brain drain has been there for a while as Indians returned home after years of working or studying overseas, driven largely by a desire to ride the country’s booming economy, leapfrog into better career opportunities, be near their extended families, and perhaps do some social good. But now, it is harder to tell pull from push, given the waning fortunes of markets abroad. “I saw the turmoil quite close," he says, referring to his last summer in London, where he interned with the German bank, “and thought it was a bad time to join the financial industry." For Indians looking to return, US business schools are helping by tapping into alumni networks more aggressively. Wharton, the business school at the University of Pennsylvania, set up formal channels earlier this year to help students find jobs in India, and launched a related website last week. Pankaj Dinodia, a Wharton alumnus heading efforts to place alumni in the country, says the idea behind connecting Indian Whartonites wasn’t initially driven by the downturn but has picked up a lot of steam because of it. “We saw folks in the US whose biggest problem—in investment banking, in consulting—was how to get a job in India," Dinodia says. The network, formed to give people access to headhunters and jobs, is organized to sort requests by industry and funnel job-seekers to relevant alumni. In the past six weeks, Dinodia has received 250 emails from Wharton graduates looking for India jobs, even as Wharton alumni in India number only around 500. “The idea was to get it off the ground quickly because now was the need," he says. The trickle may have started last year. Raj Inamdar, a Harvard Business School graduate working at a real estate fund in New York, decided to move to India in 2007 in large part because his sector showed signs of a slowdown. “A lot of why I came was because I was uncomfortable with the real estate business in the US," says Inamdar, who is now chief investment officer with a fund called South Asian Real Estate Ltd. “I felt the trends in the emerging markets were stable for the long term—more stable than the US." In the past few months, the trickle of returnees has grown closer to a flood. Harsha Raghavan, who heads the India arm of European private equity firm Candover Investments Plc., says he has been getting 300-400 resumes per month, with a majority coming from expat Indians looking to come back. Candover’s India team is all of three people. Inamdar, too, says he is currently helping five or six job-seekers in the Indian real estate market, more than he ever handled in the past. The flip side of the deluge of resumes from abroad is that a degree from an elite business school might no longer be a passport to a job. 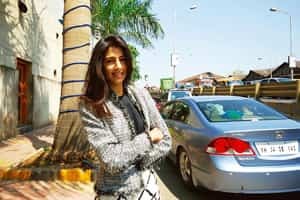 Ayesha Mansukhani, a Wharton graduate who recently rejected an offer to work with Goldman Sachs Group Inc. in London for a private equity firm in Mumbai, says the interview in India reflected the glut. “Now they ask, ‘do you have India experience?’" she says. “Before, just a Wharton degree, a Harvard Business School degree was enough." The bulk of the movement is in the financial services sector, but employees in other industries are also turning to India. Gautam Gandhi, who just joined Google Inc.’s India arm to head new business development, is an American of Indian origin who considered relocating to India after spending time here on a Fulbright scholarship. He initially intended to stay for a year, but a summer trip to the US spooked him. “The economic situation started bubbling, you starting seeing investment banking jobs getting laid off," he says. For many, the return is fuelled by a desire to be a part of India’s economy as it grows into a global power—although the irony of India catching the US’ cold is not lost on them. Still, they say they are banking on the economy here having still more room to grow. Kartik Varma, who spent a decade abroad working in finance and studying for his MBA, and who returned to India several years ago to start iTrust, a consumer finance company, described his decision this way: “It was without fear of the Western economy going down the drain, but just that India was big enough. In the long run, this was a tailwind we wanted to be driven by." Over the past few years, Varma says, colleagues who thought of coming back hesitated on concerns about whether children could go to comparable schools, or whether poor infrastructure would become too much of a distraction. But now, he says, they are looking at India in something of a new light. “European markets aren’t really going anywhere; it will take three to four years for the economy to recover," he says, describing a shift he has seen among Indians thinking of returning. “The market will be over-regulated, lots laid off, fewer opportunities, less growth." “People are saying, ‘how bad can India be?’"